I know romaine lettuce is not the most nutritional lettuce, but when I’m going for a crunchy salad, it’s usually my first choice. With the romaine recall, I have to go to Plan B for a crunchy salad-iceberg lettuce. 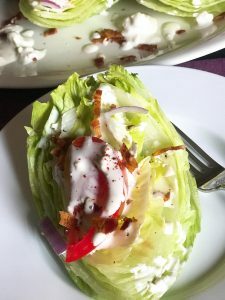 Iceberg lettuce is the choice for the classic wedge salad. 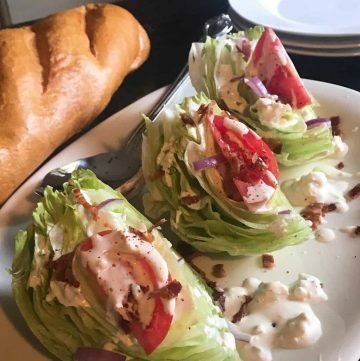 The wedge salad dates back to the 1920’s and was on just about every steakhouse menu in America until the 1970’s. 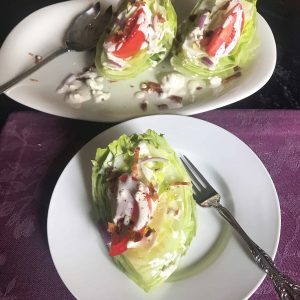 Basically, a wedge salad is a quarter head of iceberg lettuce usually drowning in a creamy bleu cheese dressing, accompanied by tomatoes and bacon. However, in the 70’s, people began to discover different greens…mesclun, frisee, endive, bibb, spring mix, packaged salads, radicchio and arugula, and the popularity of the iceberg lettuce waned. Today, it is making a comeback! I had one the other day at a restaurant and it had alfalfa sprouts and pickled ginger on it, which was quite interesting. I made mine today with homemade bleu cheese dressing, which was delicious! Here’s the recipe for the dressing! Enjoy! This creamy bleu cheese dressing dresses up the ordinary salad or goes well with a nice steak!